Deluxe edition 10LP box set! An iconic version of the greatest symphonic cycle ever composed; Beethoven's 3rd, 5th and 9th Symphonies for example are absolutely legendary recordings. Being by far the bestselling album of the Budget Boxset series for the past two years running, these recordings are now brought back into the vinyl format in a deluxe edition. 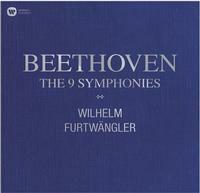 Beethoven was Wilhelm Furtwängler's guiding musical force. In his interpretations of the symphonies, the conductor generates irresistible dramatic momentum — and a constant sense of imaginative freshness — through the interrelationship of form, harmony, texture, rhythm and tempo. These recordings, all made in the late 1940s and early 1950s, in the Musikverein in Vienna and at concerts in London, Bayreuth and Stockholm, were remastered at Abbey Road Studios in 2010, bringing their sound more alive than ever before.